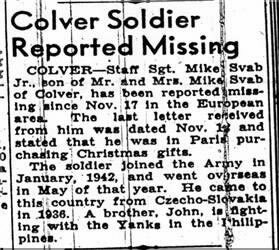 Mike Swab (or Svab) was born in the former republic of Czechoslovakia in 1923 as the oldest son of Mr. and Mrs. Mike Svab. One year later his brother John was born. In 1930 Mike Svab Sr. went back to the USA to work in the Colver cole mines. He was born in Lebanon, PA but returned as a little boy to Czechoslovakia. In 1932 his wife and the two boys followed him to Cover. Mike and his brother John grew up in Colver, PA, and when he turned 18 he went to work in the mines as well. He was a sharp dresser, fond of cars and very religious. In 1938 his brother Joe was born. 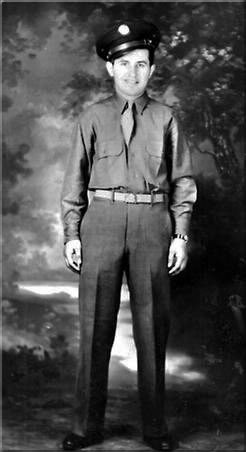 Mike enlisted in Altoona, PA, at January 7th 1943. His father said that he had to do what he had to do. His mother became very sad and could never accept the fact that he was in the army. After his basic training he arrived in Britain in May 1943 and took an amphibious-assault training for a year. His brother John was sent out to the Pacific. According to the story of his war buddy George S.Morris, Mike went ashore in Normandy, France on D-Day +1. He seemed to be in the battles for Vierville, Isigny, Auville-sur-le-vey. La Fontelaie and from Le Meauffe to St. Lo, ending up at Brest. 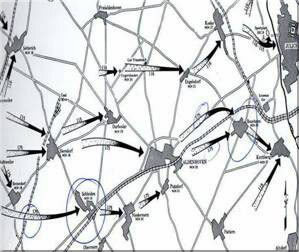 After a short rest near the borders of the Netherlands, the 29th Infantry Division moved to defensive positions along the Teveren-Geilenkirchen line in Germany and maintained those positions through October. On November 16th the 29th Division began its drive to the Ruhr river. The 175th took heavy fire from Schleiden during their attack on Bettendorf. Therefore on the second day of the attack the 175th, in order to reduce the fire that had halted the attack on Bettendorf, ordered its 3rd Battalion to capture Schleiden. After the first day of the attack Mike spent the night in a fox hole with his buddy George S. Morris. On the early morning of November 175th, Co K moved forward again in the open field towards Schleiden. Being far away in Europe nobody back home knew what happened on that early morning on November 175th, 1944. 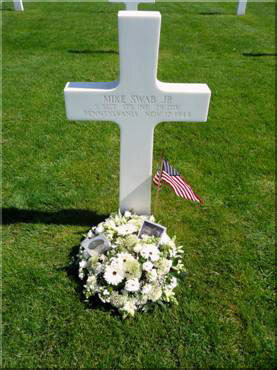 Mike Swab died at the age of 21. 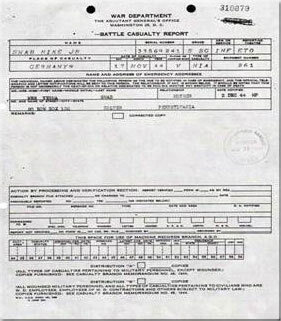 The Battle Casualty Report was dated on December 3rd, 1944. Until that time the official status of Mike Swab was Missing In Action. 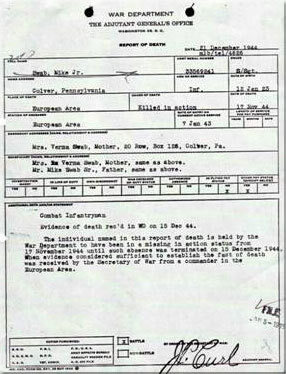 On December 21st 1944 the official Report Of Death was made up to be sent to his parents. His mother had a nervous break down when she heard that her son Mike was killed in action. 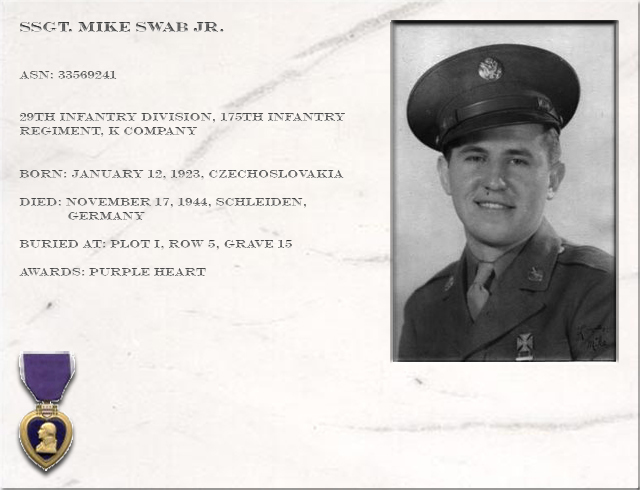 Mike Swab’s brother John survived the war. He came back from the Pacific wounded just after Mike was killed. He passed away in 2004. In 1948 Bernie was born. He never got to know his brother Mike. 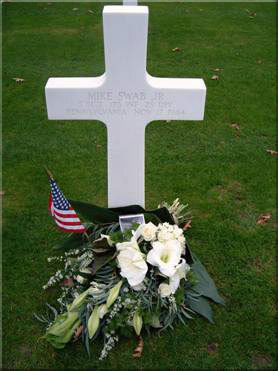 I “met”Mike Swab Jr. for the first time in Oktober 2005 by adopting his grave site at the American Cemetery at Margraten. By “googling” I found a message from Teri Montgommery. 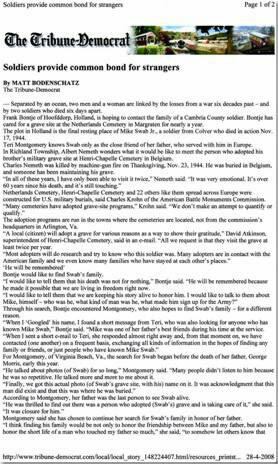 On behalf of her father, George S. Morris, she was looking for relatives of Frank Chadish and Mike Swab. They were war buddies. 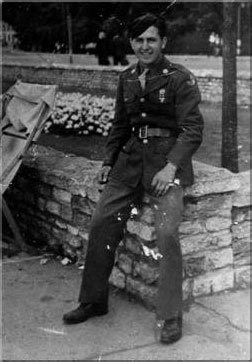 Frank Chadish was killed in Normandy. Her father kept speaking about his buddies and his wish to meet some relatives of them. I was more than happy to help Teri with her search in honour of two men, one still alive and one killed more than sixty years ago. Both connected by their efforts and sacrifices which made it possible that we can live in freedom these days. For us it is only a small thing to remember great men. 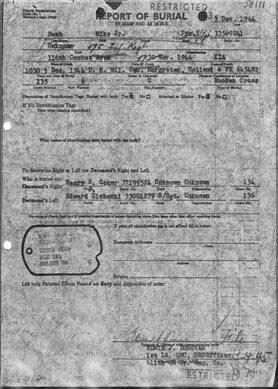 We have tried several things: placing small notes on veteran sites, send requests to historical societies and libraries, getting information from the US National Archives & Records Administration, received a copy of his Individual Deceased Personnel File etc.. This generated a lot of information but no luck in finding any relatives of Mike Swab. And then in February 2006 George S. Morris passed away. In honour of her father Teri and I decided not to give up the search. Therefore end of April 2006 I sent our story about the search to , a local newspaper in the Cambria area, the home grounds of Mike Swab. I was then contacted by a journalist, who wrote an article about it. It took only a few days before Albert Nemeth got in touch with us. 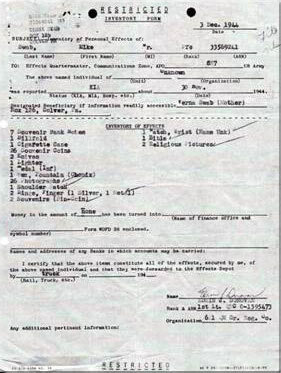 He has helped us finding the addresses of Joe, Bernie and Francis Swab, John’s daughter. The journalist, Matt Bodenschatz, wrote a follow up story. 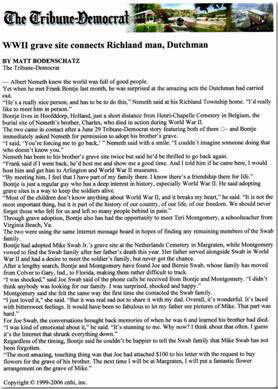 Albert Nemeth served with Bodenschatz Sr. in the National Guard and appeared to have a brother who was also killed in Germany during WWII. Charly Nemeth died on November 24th, 1944, leaving a young wife and a daughter of 1,5 years behind. He was with the 413th Inf. Reg. 104th Inf. Div. 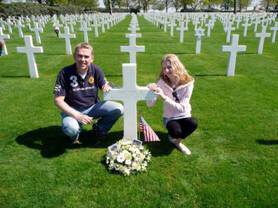 and buried on the American Cemetery of Henry Chapelle in Belgium. I was able to adopt his grave site as well. Unfortunally we will never meet; Albert Nemeth died September 2007 due to a motorcycle accident. Back to the “Swab Brothers” and their niece Frances. We were thrilled about finding the relatives of Mike Swab after our long search. Teri is in touch with them on a more or less regular base using the phone. From her I understand that they talk about her father and Mike. I write to Joe and Bernie a few times a year and occasionally send a mail to Frances telling them what I am doing and sending pictures of the grave site of their brother and uncle. For the second year Joe has sent me $100 to put flowers on the grave site of his brother Mike. On behalf of his brother Joe these flowers were placed on November 17th 2006. The day that sixty-two years earlier Mike Swab got killed on a field somewhere in Germany. On behalf of his brother Joe these flowers were placed on May 5th 2008. Liberation day in Holland. On this day we celebrate our freedom after five years of war and occupation. Let’s not forget those who made it possible that we are able to celebrate at all. Mike Swab Jr. and thousands of other young men made the largest sacrifes one can make: their life. 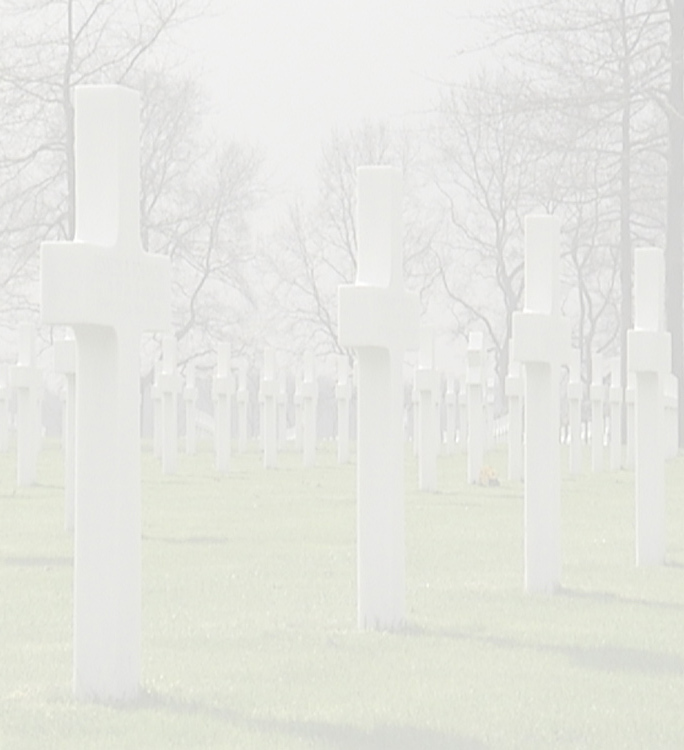 The WWII ended sixty-three years ago. Those who survived are getting less and less numerous. They told us their story. Let us remember those stories and the one who told them. Let us also tell those stories over and over again to honour the men who survived but also the men who did not come back to their wives, children and families. Let us tell those stories to our children so they won’t take their freedom for granted. In honour of Mike Swab Jr. He fought and died for our freedom. This was his story. We will make sure that it will be told over and over again and with us many more.